How Safe Is Your Child from Sports-related Injury? Sports enthusiasts, whether they’re children or professional athletes, perform better and heal more quickly from injury when they’re under regular chiropractic care. Did you know that according to research undertaken by American pediatricians, these doctors reported a 75% reduction in sick visits in their patients that are under regular chiropractic care. Seventy-five percent! These patients include babies with colic, ear infections and feeding problems, as well as older children with issues ranging from asthma to bed-wetting. 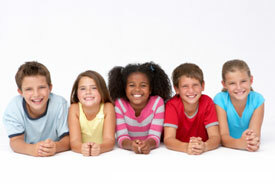 Chiropractic care also has the wonderful benefit of enhancing the growth cycle in kids. Remember “growing pains?” There’s actually no such thing, but the pain and discomfort that some kids experience in their extremities while still growing is simply indicative of a problem that needs to be fixed. We’ve established that chiropractic care and kids are a match made in heaven. There are preventative benefits, as well as enhancement benefits. The greatest gift you can give to your little one is to get them started on chiropractic care at the earliest possible age. Children blossom when their nervous systems are finely-tuned and protected. Bring them in and have them get checked as soon as possible.